Before Uni Blues alumni Gillon McLaughlan recently became AFL boss, Ivanhoe Amateurs long had the rare distinction of being the only VAFA club to have a past player who was Australian Football’s top administrator. Jack Hamilton was the league’s chief commissioner from 1984 to 1986, having worked his way through the ranks in various roles since he joined as a junior clerk in 1959. Hamilton was posthumously inducted into the Australian Football Hall of Fame in 1996. His Hall of Fame biog simply states: Tough full-back for Collingwood and became the AFL’s first chief commissioner. Was VFL assistant secretary 1957-1967, VFL manager administration 1967-1977, general manager 1977-1984, chief commissioner 1984-1986. Hamilton grew up in Ivanhoe. His family had the Eaglemont Fuel Merchants supplying fire wood and briquettes. Like many young blokes in the district during that era, Hamilton aspired to play footy for Collingwood. 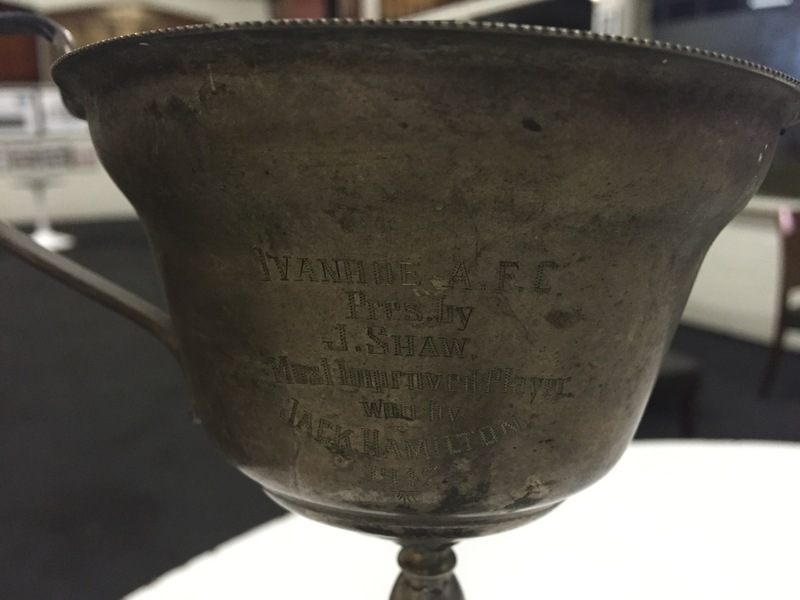 Ivanhoe Amateurs had a long association with the Magpies, we played in the same colours, and being in their recruiting zone there were many young footballers like Hamilton who went on to play for Collingwood. Hamilton’s coach at Ivanhoe was former Collingwood wingman Ron Dowling, who played 72 games for the Magpies between 1936-40, including two grand finals. Hamilton was the original fitness fanatic who was one of the first footballers to use weights to improve his strength. In his playing days, Hamilton was 184cm and 87kg. After being awarded a trophy for Most Improved Player at Ivanhoe at the end of the 1947 season, Hamilton returned to Victoria Park and made his senior debut in Round 7, 1948. It’s understood that Hamilton was originally sent to Ivanhoe by Collingwood to be ‘’toughened up’’. It must have worked because he had a reputation as a tough, ruthless, scowling full-back with a mean streak. And though he was once reported for elbowing, he got off. The Encyclopedia of League Footballers states that Hamilton was one of Collingwood’s best full-backs since World War II. 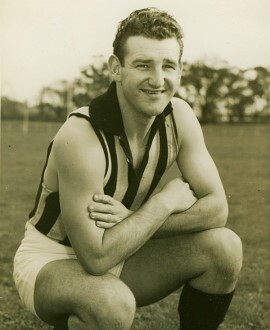 Hamilton played 154 games for Collingwood until his retirement in 1957. He was injured and didn’t play when the Pies won the 1953 flag. And he played a great lone hand in defence when they lost the 1955 Grand Final. As league boss, Hamilton “was at the helm during a stormy period which included South Melbourne’s move to Sydney, clubs under financial threat, and clearance wrangles being dragged through courts, but through it all maintained a dry sense of humour. All the football world mourned when he died tragically in a car accident in May 1990”. Hamilton’s widow Joan remembered his playing days at Ivanhoe with some fondness when I last spoke to her about 20 years ago. In particular, she recalled how he would rather let his young family go hungry than relinquish his amateur playing status while at Collingwood. Ivanhoe’s Team of the Century ruckman Timmy Robinson remembers young Hamilton delivering big heavy bags of briquettes to his family home in Brooke Street, just up the road from the Dowlings. ‘‘For a young kid up close to a league player, particularly a Collingwood player, was a great thrill,’’ said Robinson. ‘‘Harry Thomas (club president) was his contact at the club and Harry told me that while he was not able to attend Ivanhoe games he remained a keen supporter and, outside of the VFL, the first scores he checked each week were Ivanhoe’s. He would send the club telegrams of support for finals games. Hamilton was 61 when he died in a car crash near Whittlesea on May 30, 1990. The club intends to keep Hamilton’s trophy on display in perpetuity. *With special thanks to Tim Robinson for his assistance.